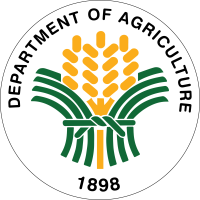 The Philippine Department of Agriculture (abbreviated as DA; Filipino: Kagawaran ng Agrikultura), is the executive department of the Philippine government responsible for the promotion of agricultural and fisheries development and growth. It has its headquarters at Elliptical Road corner Visayas Avenue, Diliman, Quezon City. The department is currently led by the Secretary of Agriculture, nominated by the President of the Philippines and confirmed by the Commission on Appointments. The Secretary is a member of the Cabinet. The current Secretary of Agriculture is Emmanuel Piñol. The Department of Agriculture had its beginnings when President Emilio Aguinaldo established the Department of Agriculture and Manufacturing on June 23, 1898. Jose Alejandrino was appointed the first Secretary. In 1901, under the American colonial government, priority was given to the development of other agricultural products, such as rice and other basic commodities, as well as fishing, forestry, and mining. This new focus necessitated the establishment of the insular Bureau of Agriculture. This bureau was put under the Department of the Interior through Philippine Legislature's Act No. 271. It was later put under the supervision of the Department of Public Instruction in 1910. The first Filipino to head the Bureau under the American occupation is Adriano Hernandez, who was himself a practicing farmer. The Bureau of Agriculture grew rapidly until it was abolished by the enactment of Act No. 2666, otherwise known as "An Act to Re-organize the Executive Department of the Government of the Philippine Islands," on November 18, 1916, and was implemented on January 1, 1917. This act provided for the establishment of the Department of Agriculture and Natural Resources (DANR), which would take over direct executive control, direction, and supervision of the Bureaus of Agriculture, Forestry, Lands, Science, and Weather, as well as all matters concerning hunting, fisheries, sponges and other sea products, and such others as may be assigned to it by law. By virtue of another reorganization act (through Act No. 4007) in 1932, the DANR became the Department of Agriculture and Commerce. The Bureau of Commerce, which used to be under the Department of Commerce and Communication, was placed under the reorganized Department. In 1942, while the Commonwealth Government was in exile, the Department was re-organized again, becoming the Department of Finance, Agriculture and Commerce. Upon the resumption of the Commonwealth in February 1945, it became the Department of Justice, Agriculture and Commerce, and then back to being the Department of Agriculture and Commerce in December of the same year. In 1947, it was renamed again as the Department of Agriculture and Natural Resources by virtue of Executive Order No. 94 by Pres. Manuel Roxas. The Bureau of Commerce, among others, was incorporated to the newly created Department of Commerce and Industry. On September 14, 1959, the DANR moved to its current building in Diliman, Quezon City from the Agrifina Circle (now the Teodoro Valencia Circle) in Manila. By virtue of Presidential Decree 461, signed into law by Pres. Ferdinand Marcos, the DANR was split in May 1974 into two departments: the Department of Agriculture and the Department of Natural Resources (which later became the current DENR). After the shift to the parliamentary system in 1978, all departments were changed to ministries. Thus, the office became the Ministry of Agriculture and Food until 1987, when the department was renamed again as the Department of Agriculture, through Pres. Corazon Aquino's Executive Order No. 116. The same EO mandated the DA to promote agricultural development by providing the policy framework, public investment, and support services, which are needed for domestic and export-oriented business enterprises. Guided by the principle that agriculture is business, the DA implemented policy and institutional reforms that freed the agriculture markets, enabling farmers to enjoy higher farmgate prices. These reforms included the dismantling of agricultural monopolies and the elimination of agricultural taxes. Reforms in the agricultural credit system, such as the phase-out of the direct lending scheme, was also initiated. In May 2014, pursuant to Executive Order No. 165, four agencies representing three-quarters of the DA's budget — the Fertilizer and Pesticide Authority, the National Food Authority, the National Irrigation Administration, and the Philippine Coconut Authority — were removed from DA control. This was part of the anti-corruption reforms which followed the pork barrel scam. The four agencies are now directly under the Office of the President, where they are overseen by the Presidential Assistant for Food Security and Agricultural Modernization. A regional executive director is assigned to each of the 17 regions of the Philippines. Bureau of Agriculture and Fisheries Standards (BAFS), formerly known as Bureau of Agricultural and Fisheries Product Standards (BAFPS) until the enactment of R.A. No. 10601. Wikimedia Commons has media related to Department of Agriculture (Philippines). ^ "GAA 2018". DBM. Retrieved 25 January 2018. ^ "Department of Agriculture - Mandate, Mission and Vision". Retrieved 28 October 2012. ^ a b c "Department of Agriculture - History". Archived from the original on 28 December 2012. Retrieved 28 October 2012. ^ "Philippine Legislature Act No. 4007". Official Gazette of the Republic of the Philippines. Retrieved 5 November 2012. ^ "Executive Order No. 94, s. 1947". Official Gazette of the Republic of the Philippines. Retrieved 28 October 2012. ^ "Presidential Decree No. 461". Chan Robles Virtual Law Library. Retrieved 28 October 2012. ^ "Executive Order No. 116". Chan Roblen Virtual Law Library. Retrieved 28 October 2012. ^ "Executive Order No. 165, s. 2014". Republic of the Philippines. Retrieved 19 October 2016. ^ Herrera, Christine F. (2014-05-19). "Alcala loses Agri control". Manila Standard Today. Retrieved 2014-05-20. ^ "Directory - Department of Agriculture". Official Gazette of the Republic of the Philippines. Retrieved 1 November 2012. ^ "Philippine Center for Postharvest Development and Mechanization". Retrieved 8 May 2018.